The number one question people ask me is where I get the ideas/inspiration for my recipes. Well, I read food blogs and watch Food Network like a crack addict. Today I am sharing with you 3 links to things I have made recently that were huge successes. 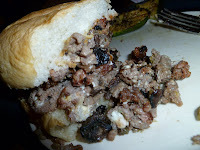 This first is an awesome Steakhouse Burger made by Josie at Pink Parsley; then one of the best breakfasts I have ever had: a Croque Madame by Jessica at The Novice Chef; and the last is a delicious Steak Arugula salad by (my idol) The Barefoot Contessa. I first saw this Steakhouse Mushroom Burger on Pink Parsley and then again when The Pioneer Woman featured her a couple of weeks later. I knew that the husband would LOVE this and who am I kidding – I would too! I didn’t have all the ingredients for the Creamed Spinach Sauce so I left it off and we used normal buns instead of Texas Toast, but it was still delicious. Other than that I followed her recipe, and man was this good! Check out Josie’s blog – I really need to get some photography tips from her! Sorry this picture is terrible - I forgot to take one till I was half way done...woops! Jessica at The Novice Chef posted this amazing Twist on a Croque Madame back in November. 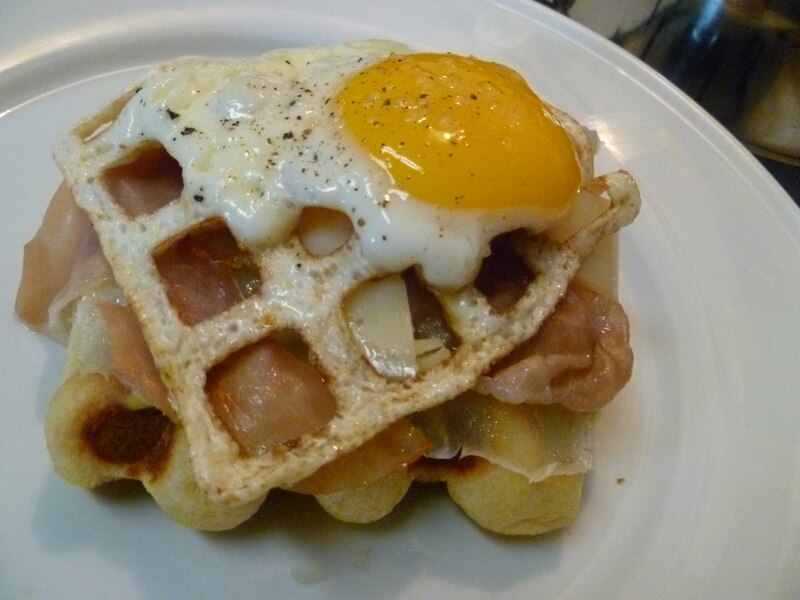 Coincidentally the FH and I had just registered for a waffle maker – well we got the waffle maker and this little gem was the first thing we made with it. DELICIOUS! Jessica is too funny – you should add her blog to your reader! Finally, I LOVE Ina Garten. Whenever I have an ingredient I want to use or the beginning of an idea I always check out her recipes for what to do. Our friends, Joey and Crystal, gave us an AMAZING wedding gift – a ton of stuff from Omaha Steaks! Earlier this week I pulled some filets out of the freezer and went to foodnetwork.com to see what ideas Ina had for them. 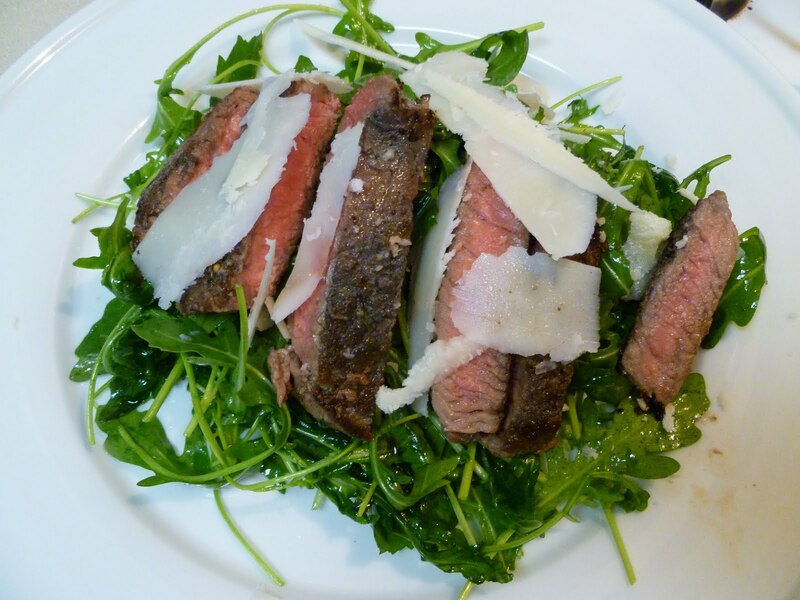 I selected this grilled filet and arugula salad – freaking delicious! Served with a little bruschetta – it was the perfect summer dinner! And oh yeah, I used pecorino instead of parm because I am cheap, but it was still so, so good! I hope you enjoy these recipes! And I am looking for blogs to add to my reading list, please let me know about your favorite blogger, TV personality, and recipe!